From MARK LEDBETTER of New Castle, in 47362, Indiana on 7/19/2018 . From William Wise Jr of Woodbine, Maryland on 2/6/2018 . We did not like these pickles at all! We now have 4 unopened jars we will be getting rid of. Claussen Kosher pickles are much better. From Paul of Schererville, Indiana on 5/20/2017 . 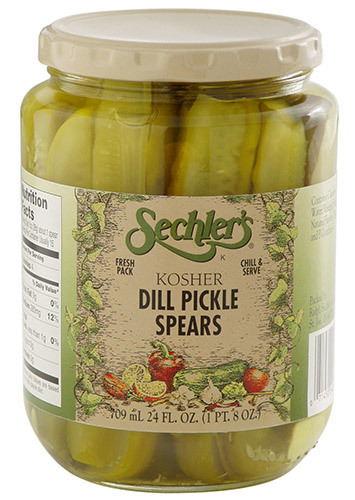 Sechler's Kosher Dill Spears are a great product. It is not readily available in stores in my area, so ordered online. Received the order promptly and undamaged. Great taste, wonderful fresh flavor. From Becky McClure of Bellefontaine, Ohio on 5/23/2016 . Love these pickles! Impossible to eat only one when you open the jar. One of my favorite snacks. Tastes homemade and not store bought.